This year's Monitoring the Future Survey shows historical lows in cigarette and alcohol trends. See data chart. 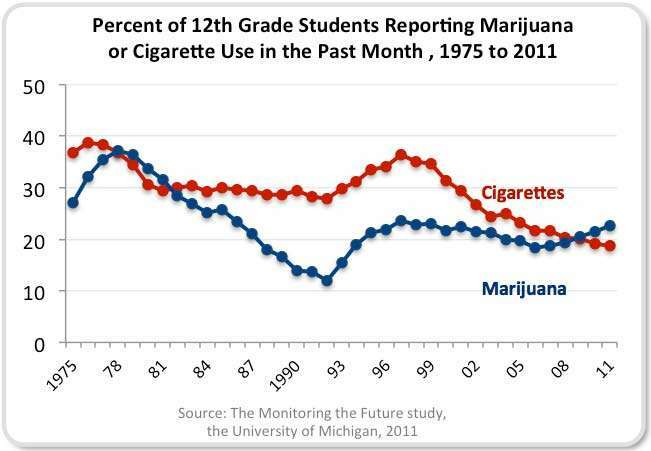 Read the full description of Percentage of U.S. twelth grade students reporting past month use of cigarettes and marijunana, 1975 to 2011. Compared to peak rates in the mid-to late 1990s, daily cigarette use is down significantly among all three grades, with 2.4 percent of 8th graders, 5.5 percent of 10th graders, and 10.3 percent of 12th graders reporting daily use. From 2010 to 2011, there were also significant declines in current cigarette use (use in the past 30 days) among 10th graders, down from 13.6% to 11.8%, and in smoking a half pack or more per day - now under 2%. Despite these continued decreases, the decline in smoking has slowed in recent years and these levels remain too high given the significant morbidity and mortality associated with tobacco use. Likewise, five-year trends showed significant decreases in alcohol use among nearly all grades and across all prevalence periods. For example, binge use of alcohol (defined as 5 or more drinks in a row in the last two weeks) declined from 8.7% to 6.4% among 8th graders, 19.9% to 14.7% among 10th graders and 25.4% to 21.6% among high school seniors from 2006 to 2011. From 2010 to 2011, decreases were observed in lifetime, past year, daily, and binge use of alcohol among 10th graders; lifetime and past year use among 8th graders; and daily use among 12th graders. While marijuana use declined in the late 1990s and early 2000s, 5-year trends are showing significant increases among 10th and 12th graders for daily, current and past year use. This year, 12.5% of 8th graders, 28.8% of 10th graders, and 36.4% of 12th graders reported past-year marijuana use. Although there were no increases between 2010 and 2011, it appears that marijuana use continues to exceed cigarette use in these students. In 2011, 22.6% of high school seniors used marijuana in the past 30 days compared with 18.7% who smoked cigarettes. Attitudes toward substance abuse, often seen as harbingers of change, perhaps could explain these findings. Among all three grades, recent trends show a decline in the perceived risk of harm associated with marijuana use. This year's survey captured the use of synthetic marijuana, also known as K2 or "Spice", among high school seniors for the first time. Almost 1 in 9, or 11.4%, of high school seniors reported using Spice in the past year. 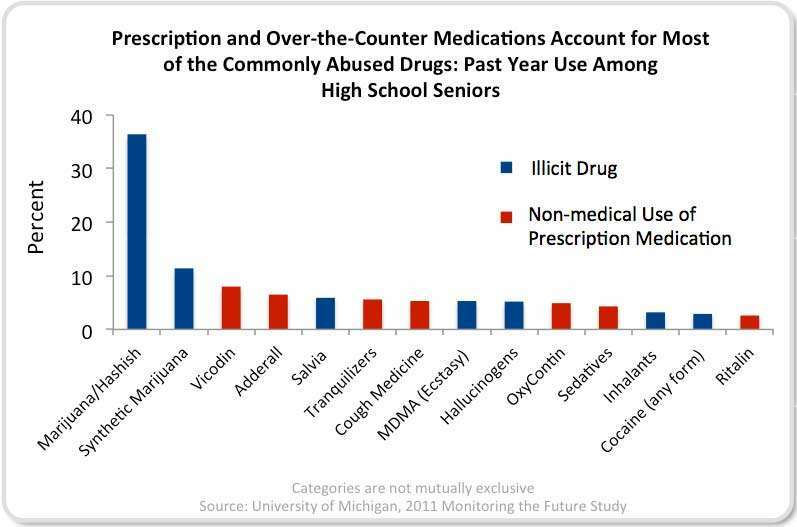 After marijuana, prescription and over-the-counter medications account for most of the top illicit drugs abused by 12th graders in the past year. On the positive side, past-year nonmedical use of Vicodin by 10th graders declined from 7.7% in 2010 to 5.9% in 2011 and the decrease in the use of Vicodin by high school seniors reported last year remained unchanged, albeit at an unacceptably high level of 8.1% in this year's survey. However, OxyContin use remains an area of concern with past year nonmedical use holding steady across all the three grades for the past 5 years. The abuse of stimulants is also cause for alarm. For example, 8.2% of high school seniors reported past year use of Amphetamines in 2011, up from 6.6% in 2009. This is also available in PDF format(369KB).